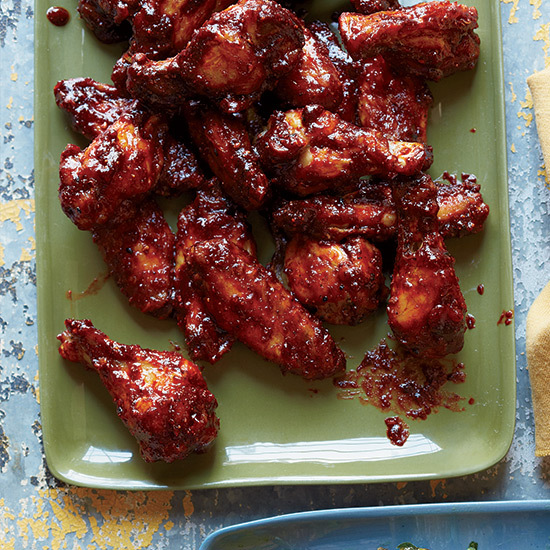 Between the deep-frying, the buttery sauce and the blue cheese on the side, classic buffalo wings are a healthy-eating disaster. Here are three ways to make them healthy and delicious. Roast them. Leave the deep-frying at the bar. At home, it’s easier—and healthier—to roast your chicken wings in a scorching hot oven (450° to 500°) until they are browned and crisp (it usually takes about 1 hour). Forget the butter. Try something different than the usual butter-hot-sauce blend. For inspiration, check out recipes that pull from the Asian pantry, like this spicy, funky, Korean-style one or this sweet-and-savory Malaysian-inspired one. Skip the blue cheese. Fact: Blue cheese dressing helps cool the burn of hot sauce. Another fact: Unless you buy fat-free (which we do not recommend), the dressing is jam-packed with calories. To help quell the burn, you can dial back the heat or make a sauce that’s both sweet and spicy. Or, if you still love that cooling dairy tang, try serving them with a Greek yogurt-based dressing.